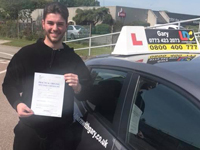 Gary is a brilliant instructor, really friendly and funny. 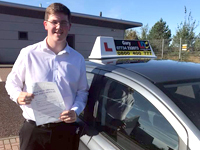 I thoroughly enjoyed every lesson and would highly recommend him to anyone wanting to learn to drive. LDC offers lots of methods for learning, including your own workbook and DVD. Gary was helpful and always let me decide what I wanted to do on the lesson and never put me under any pressure. Always encouraging me to do well. Thank you! Gary was a very good instructor who took his time to go over every rule very thoroughly. With the help from the DVD and appreciative instructor I was able to iron out my faults and gain confidence at a great pace. Thank you so much and I would definitely recommend this supportive instructor. Thank you Gary! Gary was brilliant from start to finish and made me feel so relaxed. As an overthinker Gary simplified everything for me and for the first time everything stuck in my head and slotted into place. 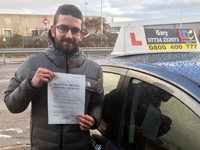 Gary provided me with links to tutorial and visually took me through roundabouts which really helped me nail them as these were a real concern to me previously. I stepped in the car with no confidence and within one lesson I was a different man and genuinely looked forward to every lesson. 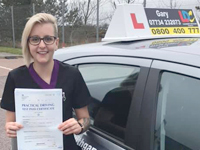 compared to my previous instructors I felt Gary really knew what he was talking about and helped me get rid of any bad habits I had picked up really quickly. Gary has so much passion and enthusiasm for his job which is really infectious and genuinely makes learning thoroughly enjoyable. I really only have positive things to say and I could go on and on and on. Gary is a really good driving instructor. He is very patient and fair. I would highly recommend him to anyone. Gary was a very good instructor for me. He was very patient and helped me improve aspects of my driving I was not very good at. When I had a lesson booked he never let me down and he made me feel very comfortable in the car. Thank you Gary! I can say Gary is the most patient brilliant instructor ever! He listens, explains every and helps you through every manoeuvre etc. I will recommend him to everyone. Thank you so much for your time and patience!!! Gary has been very patient with a very nervous driver. 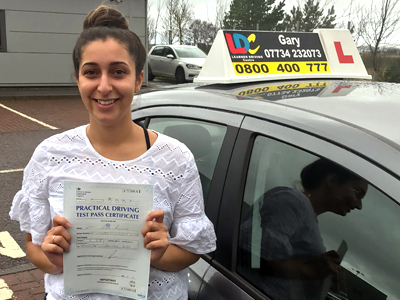 He pushed me just enough to increase my knowledge and confidence without me feeling overwhelmed which helped me pass 1st time. He worked with me through the student centred learning and each lesson was based on how I was feeling and what I felt we needed to focus on. I honestly can't thank him enough for his patient, friendly and calm attitude. I couldn't have done it without you Gary. I will be sharing his contact details with everyone I can and he will be highly recommended ! Gary is a good laugh and was really helpfull in calming me down and making sure i believed in myself. He is an amazing instructor and is patient and calm. I would definetley recommend him to anyone who asks me! 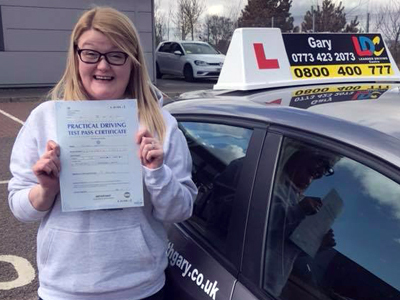 Gary is an amazing instructor and i would highly recommend him to any one wanting to learn to drive !! 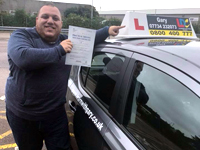 Gary was a wonderful instuctor for me, after holding a provisional license for 3 years Gary’s sense of humour helped my driving anxiety and took me forward to pass my test. Gary never made me feel bad for any mistakes I made and slways made sure I learnt from them. I used the workbook efficiently in the beginning, once all the skills were learnt i got lots of practise in. The online materials were so helpfull my theory. Thank you so much Gary !! Cannot recommend Gary enough !! Very patient during lessons, Simplifies everything so I understood things very easily. Great and friendly !! Thanks again !! Gary was a fantastic instructor ! 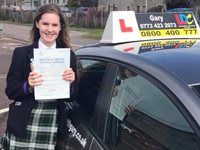 Although I had been driving abroad for many years Gary taught me so much about the rules of the road and most importantly Gary has taught me to be a safer driver ! Gary is a very patient instructor. He explained everything to me very well. He made everything very easy to understand. I would highly recommend Gary to anyone wanting to learn to drive. Thank you Gary !!!!! Gary is a great driving instructor. 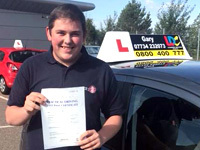 I would recommend him to any learner driver. 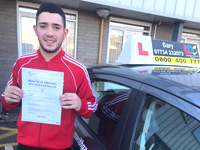 Gary was an amazing instructor, very clear and concise with all instructions and constructive advice. I was very happy at the speed of my progression. The workbook was of great help to me as it let me practise between lessons. 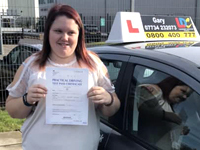 It also helped me pass my theory test 1st time. The DVD helped to reinforce all of the material in a visual environment. The online theory test was useful as it tested everything so I didn't see anything in the test I wasn't prepared for. 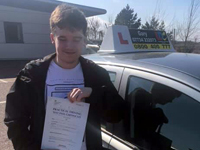 Overall the whole experience was very much enjoyable and I would definitely recommend Gary to a friend. 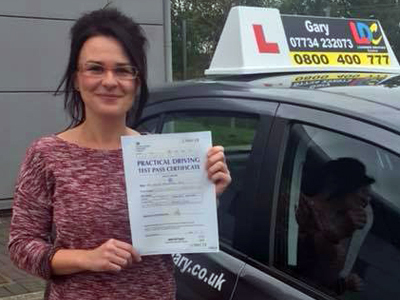 I liked Gary as a driving instructor as he help boost my confidence with every lesson . He always remained calm and kept reassuring me !!! My problem with learning is concentration. For 15 years I have been unable to concentrate on multi-tasking, but Gary was the most patient and educating instructor. Gary has a heart of gold and the patience of a saint. 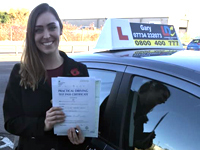 Thank you Gary for moulding me into the safe driver I am and will be in the future. My experience in learning to drive with Gary has been amazing. 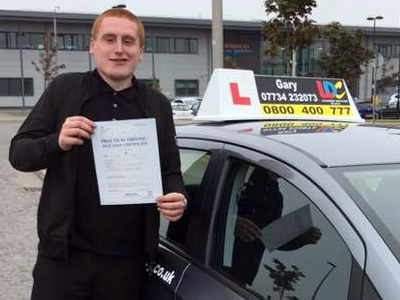 Gary's calm attitude was the biggest reason why I passed my test first time. He always remained calm even when I was getting frustrated which helped me learn from my mistakes. The LDC programme is very helpful. The DVD gave me a lot of tips in areas where I was struggling. 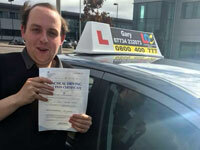 I was more than happy with Gary and would not hesitate in recommending him to any one. Gary is an excellent driving instructor. He is very patient and explained everything to me properly, taking his time and not rushing everything when he talked to me. He made me feel calm and confident even if at times I didn't feel it myself. He believed in me which then made me believe in myself. I have thoroughly enjoyed having him teach me to drive and would recommend him to anyone who wants to learn to drive. The workbook and DVD are very good and have been a big help to me. LDC is a fantastic driving school !!! I started driving over 10 years ago, Sat my test and failed in 2007. In January 2018 I started driving again with my husband. I found Gary on the LDC website in March and got cracking on with some lessons. Now it's August and I have passed my test with one minor !!!. I was a nervous wreck with no confidence. Gary was consistently patient and kind. Every lesson was calm and constant. I was able to build my confidence and skills. Now I have passed and have a skill for life !!! Can't thank you enough for all your help. I'll phone you in a few years time when my kids are ready to do their lessons !! Gary has been really patient and friendly towards me . Gary encourages you to figure out your mistakes and find a solution to do it better next time. 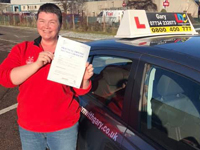 With Gary's help it made it very easy for me to pass my test !! 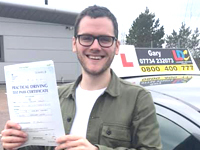 I thought Gary's training was very good and I would not hesitate in recommending him to anyone wanting to learn to drive ! 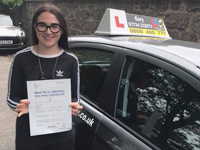 I have really enjoyed having Gary as my driving instructor, I wasn't a confident driver when I first started my lessons with him but he did a really good job of making me feel confident. I will be certainly recommending him to anyone wanting to learn to drive ! Gary is understanding, calm and collected. He makes every lesson easy to group and took the time to make sure I took it all in. I have never been so grateful for the help and support that Gary has given me to get me through my test. The student centred system made it easier for me to learn and build my confidence. Thanks again Gary ! 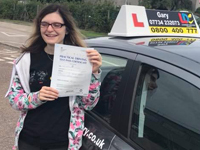 As someone who has had 3 driving instructors previously, it took a lot of confidence to choose to learn for a fourth time but observing the success Gary had teaching my fiancé (Passed in January) to drive I felt inspired to begin learning again. Gary is so calm and his demeanour really made me look forward to lessons with him. He allowed me to learn/develop at my own pace and is the first instructor who does not believe in a 'one size fits all' teaching method. He treats each students learning needs individually and his patience put my mind at ease. I have had terrible experiences in the past with instructors and I had even failed my test diabolically under their teaching. I had pretty much made up my mind that driving just wasn't for me. I cannot thank Gary enough for that. He has not only changed my life for the better since helping me pass, but my fiancés too. He is an asset to LDC and to anyone who is like me and had a negative experience with instructors/ examiners in the past. Learning with Gary will change your mind. It certainly did with me. Thank you for everything Gary. Gary as an instructor was amazing, he made me feel 100% confident in the car. I would happily recommend Gary to anybody who wants to start taking lessons. The LDC workbook also helped me through this journey and was very easy to follow. 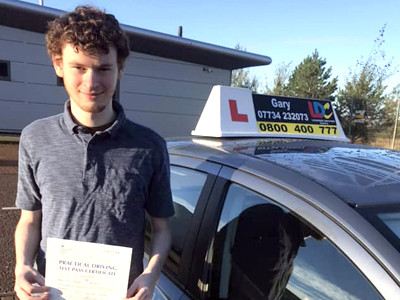 I found learning to drive with Gary a brilliant experience. 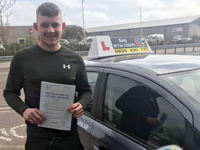 Being my second driving instructor I wasn't sure what to expect, however from day one I feel he has encouraged me with my driving and has taught me to drive to a very high standard. Gary is an excellent instructor. 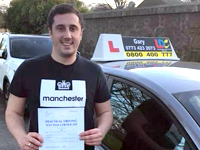 Not only does Gary teach you to drive safely he also gives you confidence and makes you feel at ease while driving. I could not recommend Gary enough and I am very grateful to him. Thank you so much Gary ! I was extremely nervous about driving when I started learning but thanks to Gary's patience, encouragement and enthusiasm my confidence has increased 100%. 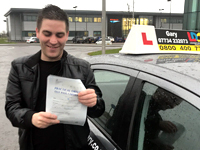 Thanks to him I actually enjoy driving now and I passed both my theory and practical tests first time !!!. The Workbook / DVD / App breaks all required skills down in to easily manageable sections. 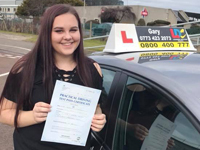 Coupled with Gary's faultless training the system allowed me to think for myself in order to gain a deep understanding and develop my driving skills along with my confidence. Thank you Gary! 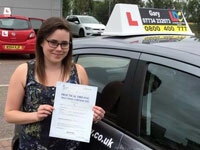 I am overly pleased with the service I received from Gary as my driving instructor. 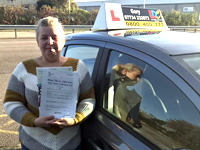 I was very happy with the tools he provided me with which aided my understanding for both theory and practical side of driving. 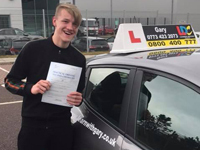 I would highly recommend him to anyone looking to pass their test. 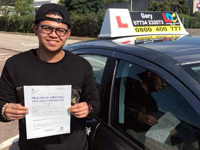 Gary was a great driving instructor who made lessons very enjoyable but at the same time he gave me all the knowledge I needed to pass my driving test. Gary was very patient with me and was always motivating me to keep going. Whenever I was unsure about something and had to ask Gary about thing I did not understand instead of just giving me all the answers he allowed me to think for myself which helped me learn much better rather than just getting information thrown at me which I'd likely forget. 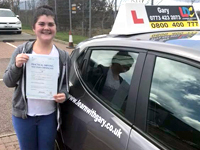 The theory test preparation resources provided were great as I managed to pass first time without any problems. The workbook and DVD also helped me a lot as it covered everything I needed to know and whenever I was struggling with something as well as asking Gary I could watch the DVD and read the workbook which never failed to help me. 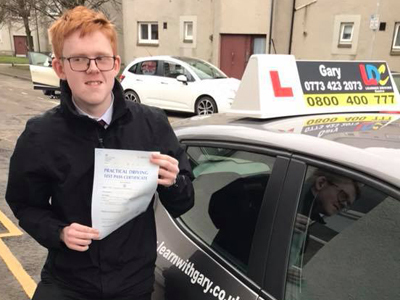 It was a privilege to learn with Gary and I would highly recommend him to anyone learning to drive, couldn't have been taught by a better person. Thanks again Gary ! 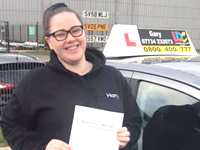 Gary made me feel more confident in my ability to drive and when it came to my test he made sure I felt that I had the ability to pass and kept re-assuring me. The LDC system 100% definitely works. 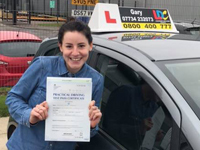 Before I didn't know much about driving and with Gary's help and the workbook and LDCs YouTube channel, I soon learned quickly and I feel this benefited me greatly. 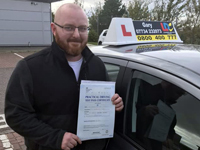 Gary provided professional help/ advice to help me overcome my hesitation at junctions and my manoeuvres. 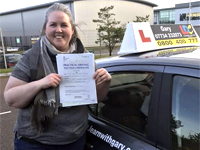 I had no confidence on the road until I started doing lessons with Gary. He was patient and supportive, pushing me to do things I wouldn't do if it wasn't for Gary giving me a little push to overcome my hesitation. Brilliant instructor that pushes you to do your best! Gary made learning to drive relaxing and fun. Every lesson I felt more and more confident. He makes you believe you can! The training methods are great and I couldn't recommend Gary highly enough.